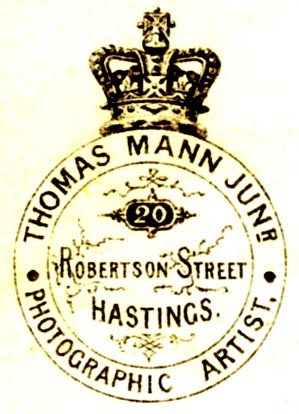 [ABOVE] The trade plate of Thomas Mann junior, Photographic Artist of 20 Robertson Street, Hastings, taken from the reverse of a carte-de-visite (c1868). 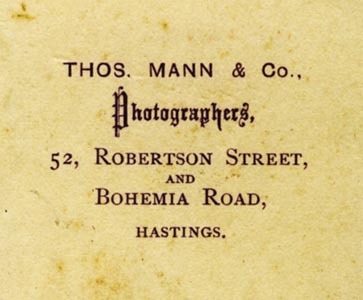 [ABOVE] The trade plate of Thomas Mann & Co., Photographers of 52 Robertson Street, Hastings, taken from the reverse of a carte-de-visite (c1870). 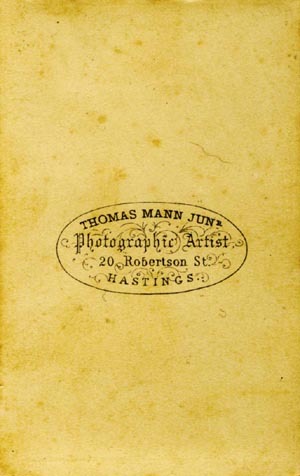 [ABOVE] The reverse of a carte-de-visite produced by Thomas Mann junior, Photographic Artist of 20 Robertson Street, Hastings (c1866). 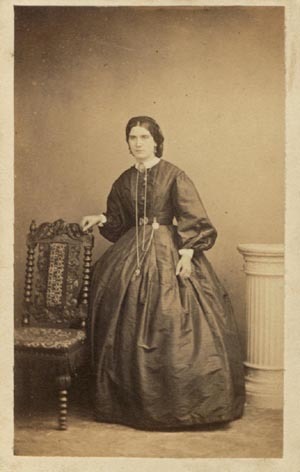 [ABOVE] Portrait of a woman standing by a chair, a carte-de-visite photograph by Thomas Mann junior, Photographic Artist of 20 Robertson Street, Hastings (c1866). 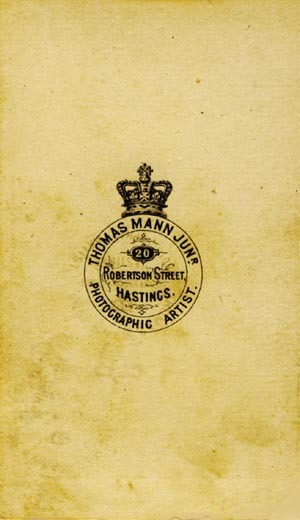 [ABOVE] The reverse of a carte-de-visite produced by Thomas Mann junior, Photographic Artist of 20 Robertson Street, Hastings (c1868). 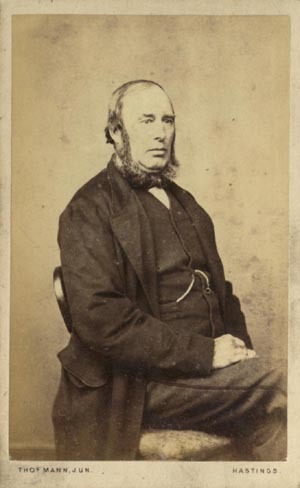 [ABOVE] Portrait of a seated man, a carte-de-visite photograph by Thomas Mann junior, Photographic Artist of 20 Robertson Street, Hastings (c1868). 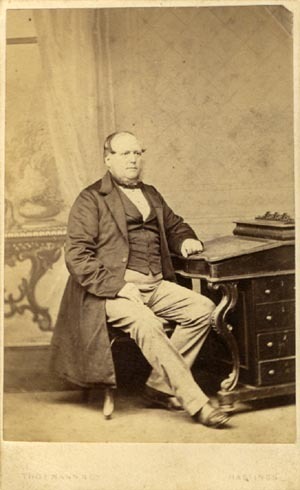 [ABOVE] Portrait of a man seted at a writing desk, a carte-de-visite photograph by Thomas Mann junior, Photographic Artist of 20 Robertson Street, Hastings (c1868). Negative No.16,325. 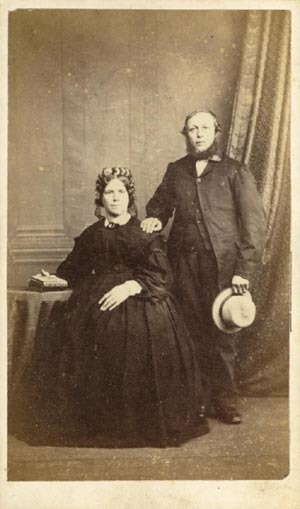 [ABOVE] Portrait of a couple, a carte-de-visite produced by Thomas Mann & Co., Photographers of 52 Robertson Street & Bohemia Road, Hastings (c1870). Negative No. 14,520. 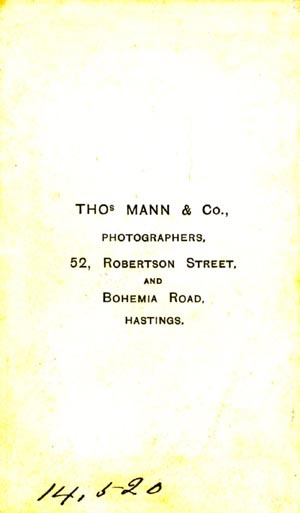 [ABOVE] The reverse of a carte-de-visite produced by Thomas Mann & Co., Photographers of 52 Robertson Street & Bohemia Road, Hastings (c1870). Negative No. 14,520. 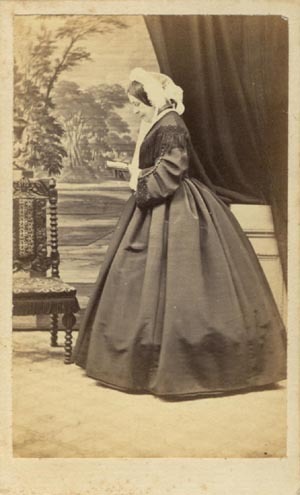 ABOVE] Portrait of a woman reading a book, a carte-de-visite photograph by Thomas Mann junior, Photographic Artist of 20 Robertson Street, Hastings (c1866). 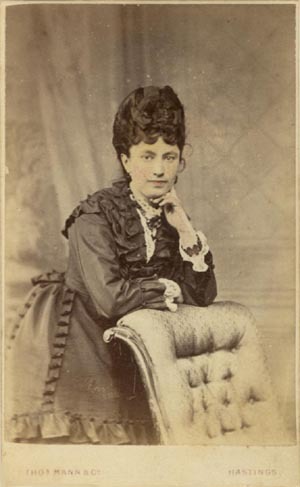 [ABOVE] Portrait of a woman leaning on the back of a chair, a carte-de-visite photograph by Thomas Mann & Co., Artists & Photographers of 52 Robertson Street, Hastings (c1872). Negative No. 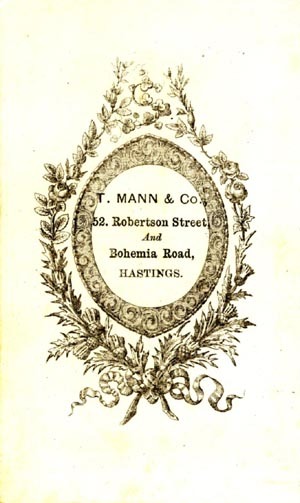 17,010 [ABOVE] The reverse of a carte-de-visite produced by Thomas Mann & Co., Artists & Photographers of 52 Robertson Street, Hastings (c1872). The printed information gives details of the back entrance in Bohemia Road, Hastings. Negative No. 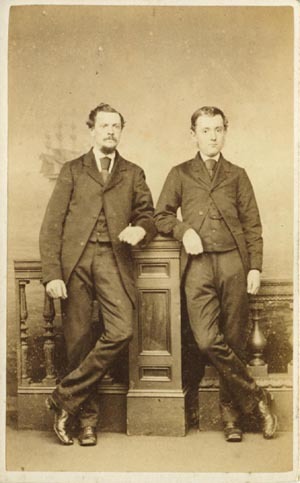 17,010 [ABOVE] Full length portrait of two men, a carte-de-visite photograph by Thomas Mann & Co., Photographers of 52 Robertson Street & Bohemia Road, Hastings (c1871). 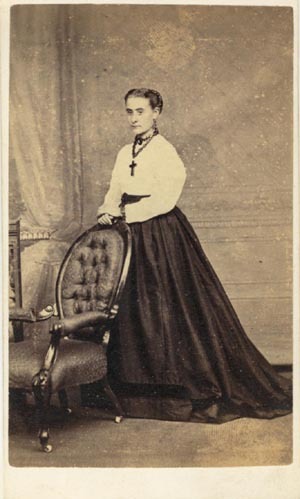 [ABOVE] Full length portrait of a woman holding the back of a chair, a carte-de-visite photograph by Thomas Mann & Co. of 52 Robertson Street & Bohemia Road, Hastings (c1871). 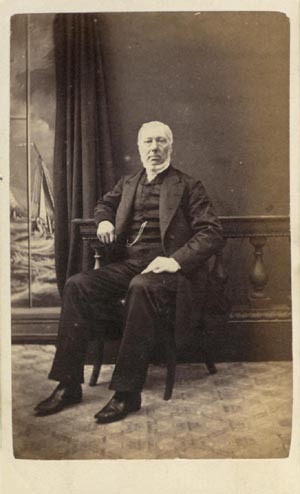 [ABOVE] A three-quarter length portrait of a seated man, a carte-de-visite portrait by Thomas Mann junior, Photographer of 52 Robertson Street & Bohemia Road, Hastings (c1873). Negative No. 18,621. 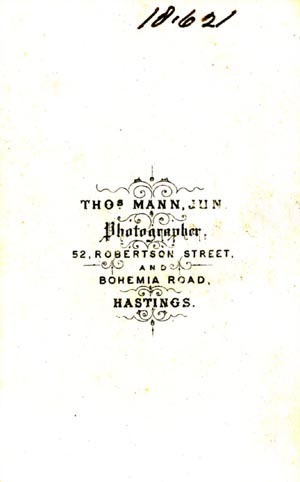 [ABOVE] The reverse of a carte-de-visite produced by Thomas Mann junior, Photographer of 52 Robertson Street & Bohemia Road, Hastings (c1873). Negative No. 18,621. 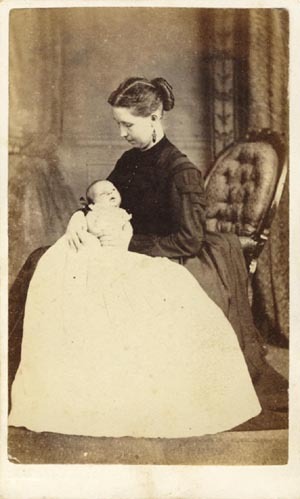 [ABOVE] Portrait of a woman holding a baby, a carte-de-visite photograph by Thomas Mann & Co. of 52 Robertson Street, Hastings (c1871). 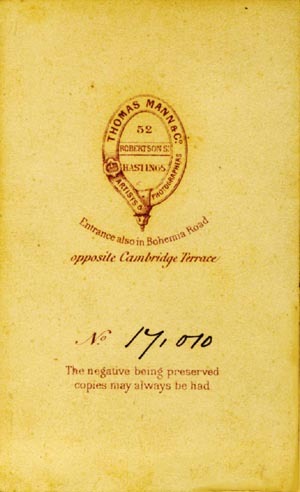 [ABOVE] The reverse of a carte-de-visite produced by Thomas Mann & Co. of 52 Robertson Street & Bohemia Road, Hastings (c1871).